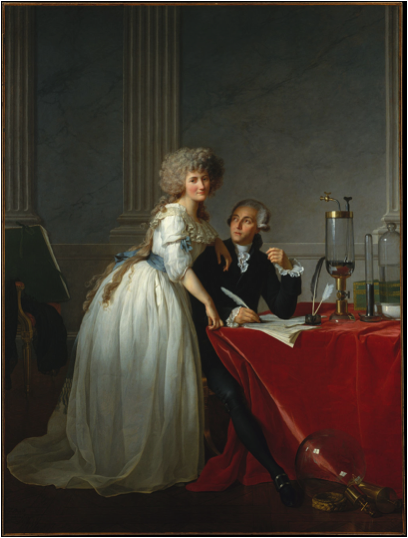 Portrait of Monsieur de Lavoiser and his Wife, chemist Marie-Anne Pierrette Paulze by Jacques-Louis David, 1788. Before having his head chopped off by French revolutionaries in 1794, the ‘father of modern chemistry’ Antoine Lavoisier made numerous important discoveries. One of his most significant discoveries was that the respiration of animals, the energy releasing process that transforms the oxygen that we breathe and the sugars that we eat into carbon dioxide and water, is a form of combustion, like that of a car engine or a candle burning. Through his collaborations with mathematician Pierre Simon de Laplace, Lavoisier designed the first calorimeter, a device that allowed for very precise measurement of the energy released during a chemical reaction. Together Lavoisier and Laplace compared the amount of energy and carbon dioxide released from a live guinea pig placed in the calorimeter, to the energy released from combustion of carbon. What they found was that the ratio of energy released to carbon dioxide produced was the same for both the respiring guinea pig and the burning carbon. This led them to conclude that respiration is similar to the combustion process that occurs when you set fire to the carbon. These observations explained the mystery of how animals produce heat. As anyone who has been wormed by a fire on a cold night knows, combustion is a very exothermic (energy releasing) process. What Lavoisier and Laplace demonstrated is that we all have a type of slow burning fire inside us. Due to the central role of exchanging oxygen for carbon dioxide during combustion Lavoisier concluded that the respiration was happening in the lungs. However, we now know that the lungs only act as a gas exchanger for the circulatory system: the system of arteries and veins that carry blood all throughout our bodies powered by our pumping hearts. The blood carries the oxygen to every cell in our bodies and the cells themselves respire. This process, now known as cellular respiration, produces most of the energy that cells use to power all of their complex processes. The carbon dioxide waste produced from cellular respiration is carried by the blood back to the lungs and released into the atmosphere. Another thing that anyone who has stood by a fire at night knows is that if not treated carefully fire can be very dangerous. A poorly tended fire can spread where you don’t want it, ruining your clothing or carpet and it can even cause painful injury if it burns your skin. Cellular respiration can also be dangerous since a number of the energy-releasing reactions can produce highly reactive bi-products known as reactive oxygen species (ROS). These ROS molecules can diffuse around the cell and damage the important cellular machinery made up of proteins and nucleic acids. This is analogous to a spark jumping from the fire and burning your hand. So how do the cells deal with this danger? Just like we prevent our fires from spreading by containing them in fireplaces, cells localize cellular respiration to a special organelle known as the mitochondria. 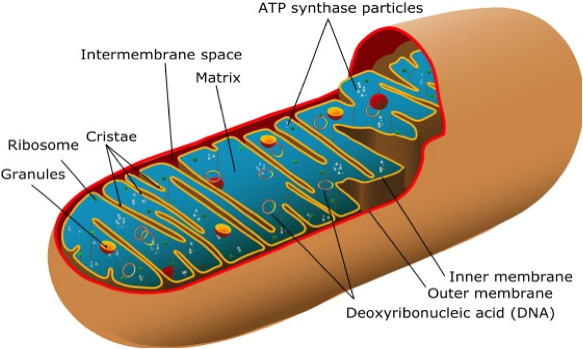 The mitochondria has two layers of membrane around it and most of the high energy reactions of cellular respiration occur on the very inside (known as the matrix) which makes it ideal for preventing the escape of any ROS molecules produced. Also the protein machinery that carries out the reactions of cellular respiration have evolved to be very efficient, effectively preventing the production of the ROS bi-products. The Animal Mitochondria. Diagram by Mariana Ruiz Villarreal. Used under Wiki media commons license. The importance of the mitochondria and its highly efficient machinery in containing these reactions is made very clear when things go wrong. It has been shown that mutations to the proteins that comprise the machinery can reduce their efficiency, resulting in less energy being generated from cellular respiration and the production of more ROS molecules. People that have these mutations can develop severe neurodegenerative diseases (known as mitochondrial diseases), which can lead to blindness, seizures or even death. To date there is no known cure for any mitochondrial diseases. However, because of the special nature of mitochondrial genetics (mitochondria unlike any other organelle contain their own DNA), it is possible to prevent mitochondrial diseases by introducing healthy mitochondria into an embryo. The donated healthy mitochondria allow the otherwise doomed person to lead a perfectly healthy life. Another example that demonstrates the importance of properly functioning mitochondria occurs when oxygen is depleted from a cell. Oxygen depletion, known as ischemia, can occur during a heart attack or stroke, two of the most common killers of people in the developed world. Ischemia causes the cellular respiration machinery in the mitochondria to shut down resulting in a build up of a certain metabolite, known as succinate. When oxygen is restored to the cell, known as reperfusion, the mitochondrial machinery reactivate and quickly burn through all the succinate in an uncontrolled manner. This uncontrolled activity produces a lot of ROS that then ‘burns’ the surrounding tissue, sometimes killing cells. This tissue damaging reaction is known as ischemic reperfusion injury and can be the cause of severe brain damage after a stroke and is also the reason hearts are much weaker after surviving a heart attack. Lavoisier taught us that by using cellular respiration to produce energy our bodies are truly ‘playing with fire.’ The heat and energy generated are essential to all cellular processes; however, the high-energy nature of the chemical reactions can result in damaging ROS bi-products. Much is still unknown about how the cells use mitochondria to manage this important and delicate balance. Furthering our understanding of the basic science behind these important biochemical processes has the potential to lead to new treatments for mitochondrial diseases as well as ischemic reperfusion injury. Great piece! Though I have to admit being ‘wormed by a fire on a cold night’ sounds a little distressing to me.